You've decided to start a home studio. Well! ​You don't go wild and spend like $500 on a set of studio headphones. Infact for a decent use; you don't need spend anywhere over $100. 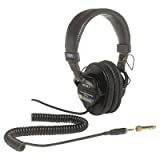 Hence I have compiled this list of best studio headphones under $100 which I believe will offer you studio quality sound and the flat frequency response that studio headphones are known for. Presonus may not be a renowned brand in the headphone industry... but the company has some excellent audio products. Presonus HD7 is one of those studio headphones under $100 that comes with purple accents and looks kinda cool. It is the cheapest studio monitor headphones in our list. Let’s take a look what it has to offer for a price of just under $30. ...meaning they have a porous back on their ear cans allowing air to move in and out. 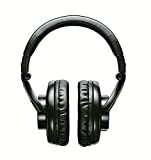 To know about open-back headphones; do check out guide about different types of headphones. It has two small metal bands at the top which acts as a framework for these headphones. Beneath it, there’s also a fabric band with Presonus branding. The ear cans comes with pleather padding (also known as synthetic leather padding) which aren’t the most comfortable ear pads and your ears will be grasping for breath of fresh air after sometime. ...as the Presonus HD7 are just rebranded version of similar headphones. With a semi-open design; sound staging is definitely excellent on these headphones for a cheaper price, they even offer great balance between the lows and mids. Highs can get a little harsh at times but nothing that will hamper the music mixing experience. ...however weight could be an issue as these carry a weight of 9.8oz and could cause neck pain if used for longer duration. Still studio monitoring headphones do have a bad names for themselves for being heavy. 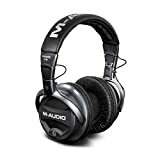 These are definitely a great choice if you want best headphones for Rock Music. What do you think about the Presonus HD7? Do they deserve to be in our list of best studio monitor headphones under $100? Let us know your opinion in the comment box below. M-Audio is a renowed brand when it comes studio grade products. Their products are mainly targeted at studio professionals and hence have a basic and to-the-point design. Let’s see if the M-Audio Studiophile Q40 deserve to be in our list of best studio headphones under $100. Looks wise... the M-Audio Studiophile Q40 have a decent design which isn’t boring, and not at all flashy at the same time. They do stand out from the crowd with a unique design at the back of its ear cans. Construction is 100% plastic which is expected for any studio headphones under $100. However the built quality is pretty sturdy considering its price. ...meaning the back of its ear cans are packed and do allow outside air to interfere. This allows good noise isolation and helps in blocking outside noise by a bigger margin compared to semi-open back headphones. Looking at the earpads on these studio headphones; they have very less depth and drivers stick to your ears when the Q40’s are worn. It has a soft leather padding which allows them to be worn for a longer time. Specifications wise; these headphones provide frequency response of 10Hz-20kHz allowing to generate deep level sound with great precision. Impedance on the M-Audio Studiophile Q40 is rated at 64 Ohms and weigh around 8.8 Oz. ...making them easy to store and carry anywhere. The company’s generous enough to throw in a high quality pleather carry pouch making them easy to tuck around. These are an ideal match for any person looking for cheap studio quality headphones without making a bigger hole in his pocket. Status Audio is a relatively new brand and if you haven’t heard about them, I won’t blame you because the brand isn’t about over the top advertisements and marketing. The studio headphone in question here is Status Audio CB1, which is a closed back studio cans with quite a heft to it in terms of the overall look and weight. On the other hand, the brand also has another headphone, which is an Open Back Headphones, cheekily nomenclatured as OB1. Overall, the Status Audio CB-1 are the perfect studio headphones under $100, however they get the job done for the price they sit at and offers a better sound performance considering its price. Before we talk about the overall headphone performance, let me tell you once you hold the headphone, you can easily notice the differently shaped ear pads. The ear cans are round, whereas the ear pads are oval in shape, even the size reminds me of ear pads on Brainwavz HM5. Talking about specifics, the CB1 features 50mm drivers that offer close to accurate sound production and wide soundstage as well; considering the fact that they’re closed back headphones. It has an impedance of 32 Ohms, which eliminates the use of an amplifier, whereas it has a frequency response of 15-30,000 Hz. However one thing that a lot of people may find problem with; is the weight, which stands over at 13.2 Oz, which can cause slight neck pain with prolonged use. They also fold over similarly to the Audio Technica M50x, however offer a competitive performance at fraction of its price. 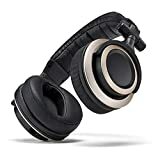 For price close to $60, they offer very good sound reproduction and performance as well and its flat sound signature makes it an ideal headphone to be used by music producers who are just starting out with producing music. It also does comes with a 3m straight cable and 3m coiled cable both having one side threading for screwing the included 1/4-inch adapter. Ok! Don’t start to fumble, if you till now haven’t heard about Takstar Pro80. These headphones go around the market with different names and are rebranded by lot of companies. However Takstar is the original manufacture of these headphones. The Pro80’s are Chinese manufactured headphones, rebranded and sold by different companies. No matter how horrible this sounds... these studio headphones under $100 have a remarkable sound (otherwise they wouldn’t stand a chance to be featured on our list). ...Takstar is an OEM (Original Equipment Manufacturer) company, which means these companies take contracts from different companies, manufacture products for them and other companies sell them under their name. For example; your iPhone is sold by Apple, however iPhones are originally manufactured by Chinese company Foxconn. Hence Foxconn is an OEM of iPhone. Now coming to headphones; they feature a Beyerdynamic-like design and looks somehow similar to Beyerdynamic DT440 in terms of design. If you buy these headphones; it’s hard to notice the box in which they come with. Built out of aluminum; the box makes Takstar Pro80 look like 1000 bucks. Inside the box we get Pro 80 Studio Quality Headphones, 6.3mm gold plated adapter, soft fabric like carry pouch and user manual. Similar to the above mentioned M-Audio Studiophile Q40; the Takstar Pro 80 also have a closed back design which tends to offer good sound isolation. ...however it’s the most durable type of padding. Specifications wise; Takstar Pro 80 have a large 53mm diaphragm and rated impedance of 60 Ohms. ...however the one sold on Amazon has a straight non-detachable cable. 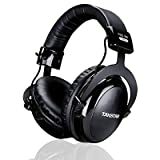 Takstar Pro 80 definitely can be considered an underpriced studio quality headphones and can be considered best studio monitor headphones under $100. Design wise AKG K 240 look very similar to previously mentioned Presonus HD7 Studio Quality Headphones. Similar to it; the K 240 features a semi-open design allowing more air to mix in and hence providing a great sound stage. The box of AKG K 240 includes the headphones itself along with 6.3mm gold-plated adapter and nothing else... not even carry pouch. Looks wise these studio headphones have a decent design with golden-yellow accents. This gives it a premium look and make them feel more worth than they are. It features detachable cable which is 3 meters long in length. The earpads sport pleather padding which is comfortable for long use. Since these earpads are completely round; you might not get a correct fit using them. Specifications wise; the K 240 has impedance of 55 Ohms and can produce frequency between 15Hz-25kHz allowing it to have a balanced sound with tight bass and clear highs. The best part is; the bass on these studio quality headphones isn’t artificially boosted, hence you’ll only hear what the musician intended you to listen. Shure is a great brand that has mastered both the markets of audio products for studio professionals straight to normal consumers with their high quality audio devices. Shure SRH440 is one of those headphones thats stands on the line between an advanced consumer headphones and a full fledged studio headphone. Featuring a design similar to its big brother Shure SRH840; let us see what SRH440 has to offer. ...more inside we have our cool looking Shure SRH440 studio quality headphones, moreover there’s a coiled detachable cable and 6.3mm gold plated adapter. The company has also been generous enough to throw in a pleather pouch. Shure SRH440 are build like a rock and have the best construction quality in our list of best studio headphones under $100. Featuring a matte black design, both the ear cans are distinguished with a Blue and Red color to differentiate Left and Right cans respectively. Headband on the SRH440 has the best built quality of all the headphones in our list and has pleather padding. Even both the earcups feature pleather padding. The best part is; these earcups are user replaceable; hence if you decide to swap them out with something more comfortable velour padding earcups, then you’re free to do that. ...along with impedance of 44 Ohms offering Sensitivity of 105dB/mW and frequency range of 10Hz-22KHz that helps in producing deeper bass. Considering their build quality, these headphones weigh around 9.8 oz and one can do feel the weight on their neck after prolonged use. With an industrial look and great built along with reference grade sound; Shure SRH440 have managed to get a great balance between everything and making them best studio monitor headphones under $100. For a very long time Sony MDR 7506 have dominated the game when it comes to studio quality headphones. Even now these headphones are regarded with highest respect as the best studio headphones under $100. Launched back in as late as year 2005; the design of Sony MDR 7506 may look a little outdated but nothing that seems you can’t own. Being a studio headphone; the package includes regular set of accessories we’ve seen in all the headphones in the list. It includes the headphone itself, along with 6.3mm gold plated adapter and a carry pouch. Design wise these headphones looks way too similar with earlier iterations of Shure Headphones, even the MDR 7506 have color coding Blue and Red to describe Left and Right Channels. Built quality is pretty good and with proper use; one set can survive for over 5 years. With complete black matte look; these headphones are what defined the studio headphones design. They come with a coiled cable which is 3 meters long and pretty durable. However the cable aren’t detachable which could be factor since the wire is pretty long and back then detachable cable feature could only be seen in high end studio headphones like the Sennheiser HD600 or so.